There are a number of benefits, risks and best practice measures that should be considered if using recycled manure solids as an alternative bedding material. The study analysed the occurrence of a range of pathogens in cubicles bedded with RMS. Recycled manure solids (RMS) is the solid fraction of separated slurry mostly consisting of undigested fibre which is usually in excess of 35 per cent dry matter. Not all retailers and milk processors allow the use of RMS, and some may have extra conditions put in place for its use. Andrew Bradley, professor of dairy health and welfare at Nottingham University, speaking on a EuroDairy webinar, said when considering the risks of using RMS, it was important to analyse its impact on animal health, human health, both directly through its use on farm and indirectly for the consumer, and also the impact on milk quality. 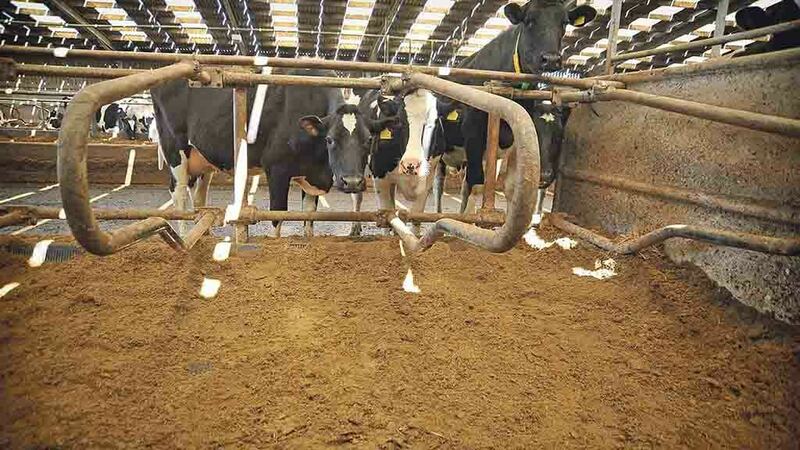 An ongoing study, funded by AHDB and later the Welsh Government, aimed to assess the presence of pathogens and milk spoilage bacteria in cubicles bedded with RMS compared with other materials. As part of the study, epidemiological studies were carried out on 125 farms, 40 bedding with RMS, 41 with sand and 44 with sawdust. In most cases, fresh RMS was added to the beds daily or at least three to four times per week, sand was usually once every fortnight and sawdust was usually once per day. He said it was important this was taken into account during the study. They analysed the occurrence of a range of pathogens including thermoduric bacteria, salmonella, streptococcus spp, staph aureus, bacillus cereus and listeria. However, although RMS had the highest TBC, there was more variation within the groups than between the groups, for example, the presence of coliforms was significantly higher in RMS than sand and sawdust, but both the highest and lowest counts for this bacteria appeared on farms bedding with sawdust. Bacillus cereus, which causes enteritis in humans, had significantly higher counts in RMS herds than sand or sawdust and it reached extremely high levels. Listeria was tested on a positive or negative basis, the presence of listeria was significantly higher in sand beds than sawdust or RMS, which was to be expected as listeria is a soil-based organism, explained Dr Bradley. Another aim of the investigation was to assess the transfer of pathogens from different bedding types to the bulk milk tank. They found that although TBC on bedding was typically higher on farms bedding with RMS, this was not reflected in milk TBC. There was no clear correlation between TBC in beds and in milk. They also found the TBC for RMS was typically higher on farms bedding with shallow RMS rather than a deep bed, however the bacillus cereus count was significantly higher in deep bedded RMS herds, as they prefer the anaerobic conditions. When it came to looking at udder health using somatic cell count (SCC) information, there was no relationship between SCC and bedding type, there was no higher rate of new infection on RMS beds and no higher levels of chronic infection. They also looked at ways farmers could mitigate possible adverse impacts of the use of RMS and they found fore milking was associated with lower TBC in milk and using a pre-milking disinfectant resulted in a lower streptococcus count. Cluster disinfection seemed to lower the occurrence of thermoduric bacteria in milk. RMS is a category two animal bi-product so there are a number of guidelines and rules regarding its use on farm. Farms using RMS must notify Animal Plant and Health Agency (APHA) and Red Tractor. RMS must only be produced using raw manure or slurry from cattle on the same farm as it is being used. RMS must be produced using a slurry separator which is fit for purpose and farmers are not permitted to share equipment between farms, or between processing feed and RMS without cleaning and disinfecting between uses, for example, if the same loaders are to be used for both jobs. The same goes for shared separation equipment. Material which has been composted or digested must not be used. RMS must not be produced from slurry or manure where there has been an outbreak of a notifiable disease, where animals are showing clinical signs or have tested positive to an enteric disease such as salmonella, or from cattle which have aborted and are under brucellosis investigation. Slurry or manure from animals tested positive or inconclusive for TB, animals in quarantine pens and animals undergoing treatment for disease should not be used for the production of RMS. Other materials such as birthing fluids, parlour washings and waste milk must not added to any manure or slurry being used for RMS. Cattle bedded on RMS must be over 12 months old and must only be used on cubicle beds, not in loose yards or pens. Any farms which use RMS as a bedding material must practise pre-milking teat disinfection and milk must be pasteurised. Cattle must have been residing on the farm for at least one month before their faeces can be used to produce RMS.